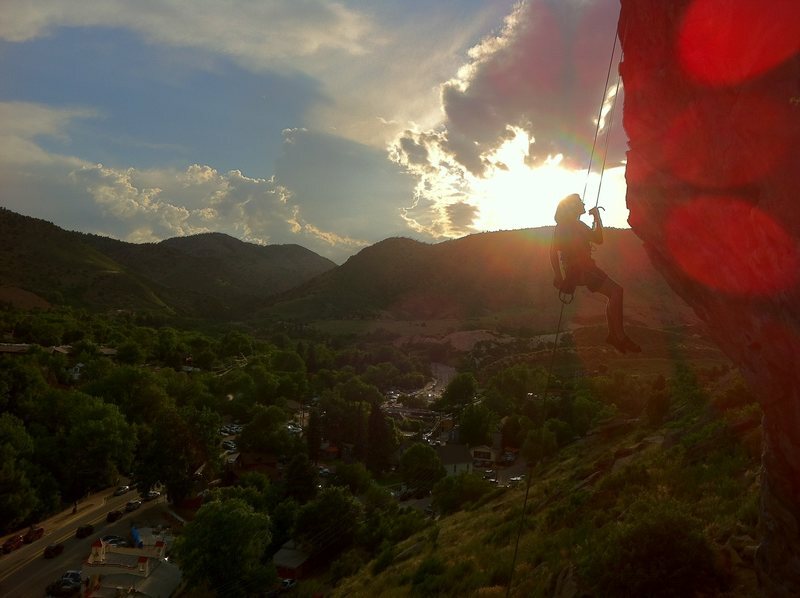 This could be the best single pitch of five-ten overhung pocket pulling found close to the city of Denver. The Nautilus Cave @ Morrison is a convenient opportunity for endurance training and dynamic movement - climbable year-round (morning shade). Homegrown local, Anna, at the last bolt. This is not a sport route! Tricky gear placing is mandatory for protecting the upper half. Almost to the first bolt! Photo by Mountain Project contributor Mike Carrington. It is not a beginner's 5.10 either! The Nautilus Cave is a sandbag with slippery footholds. Photo by Mountain Project contributor MLloyd. Matt Lloyd cuts his feet loose! Photo by Mountain Project contributor Joseph Haught. World famous Red Rocks Amphitheater is on the foothills just right of the setting sun (photo above). Great blue herons and bald eagles sometimes cruise by. 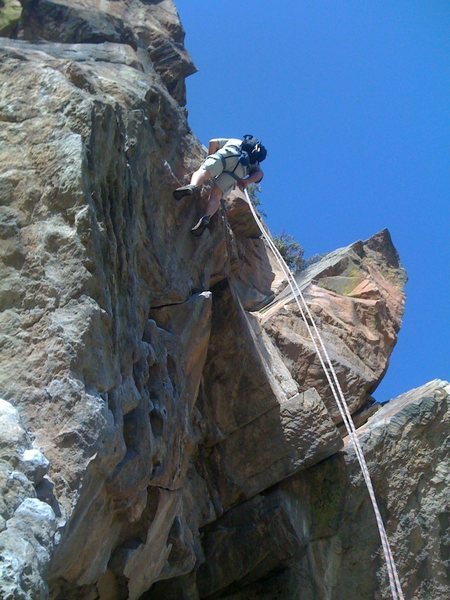 Top ropers: approach from climber's right with some 3rd classing up a steep but juggy corner. A long draw is nice to back yourself up while you thread etc. Sport pros: begin with three bolts that protect the crux. Use finger-sized cams and RPs for finishing. Also, a small cam behind a flake can protect the final move up to the first bolt (tricky to key into the best spot). Trad Style: at the crux, there is a thin crack that leans right. Small Aliens and medium to large RPs can be strenuously placed. It's been bouldered/soloed a lot too. The Nautilus Cave Pitch, full view. Almost to the first bolt. The easier finishing section at the top. Whitney pulling through the huecos. I'm not a chopper (if there chopped, they'll re-appear) but was outraged when I showed up to climb the "cave route." The climb is "sporty" and difficult to place gear on (gear was the "crux") but the bolts seem to be poorly placed. The 2nd bolt, (the one that is a foot to the side of the #1 TCU and #5 stopper, just before the crux) is for some reason stuck in a dish instead of on the nice smooth face. Also, I think it is a bit irresponsible to not bolt the top. I would prefer if the bolts never showed up, but it would be worse if some bumblie took a ground fall near the chains and the area received access problems. There are several versions of this route, all really good. 1. The regular. Up the arête, then up a short finger crack with jugs. A step right to a ramp/foothold. Then a layback up and left to easier ground. Then up the juggy dihedral left again, under the bolts on top. This is about 5.10. 2. Start five feet left, up a crack to the overhang. Then go straight over the steep bulge just left of the crack. Easier to start, but a long reach at the overhang, as I recall. 5.10/5.10+.3. Start on the right of the cave. Swing out left along a steep rail which joins the regular route at the rest. This is a tad harder, and for sure more hairy. 5.10+.4. Start in the back of the cave, and climb steeply out to a jug at the lip, just right of the semi-rest ramp. Good knee bar somewhere. This is a tad harder again, plus (with a toprope) a fall from the starting moves would involve a big nasty swing out to the boulders. Exciting! 5.11-. Any which way, this is a fun juggy route. A favorite. I wish I had known that the bolts ran out. I guess it's just a good example of "Look before you leap," because my girlfriend and I definitely went up there with just some quickdraws and a short rope as an afterthought one day. As it turns out the climbing from the third bolt to the chains is pretty mellow, but I was definitely into groundfall territory by the time I reached the top. A few small finger sized cams would've got it done. 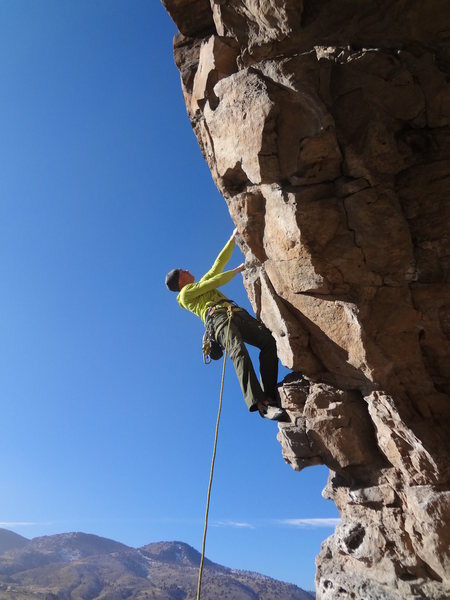 Great route, and echoing what others have said - I feel like it's more of a 9+ than a 10-. Maybe deserves the 10- because of the high placement of the 1st bolt and / or the runout at the top, but (again) like others have said - that runout is protectable with a nut. Also - climbed this during the summer months, and there was some *extreme* BUG activity going on around the last bolt. Around the ledge if I remember correctly - threw my hand up there, only to grab nothing but BUG - no rock. Well, rock underneath the BUG, but definitely had to sweep them away. Kinda felt like that Indiana Jones movie. Anyways - not sure if those guys are a seasonal issue or what - but just a heads-up. I'd be wary of sending a budding 5.10 leader up there. I think that if you toprope this thing to death and rehearse the moves before giving it a go on lead, you might come out with 10b. Onsight, with strenuous placements and numerous possibilities for sequences, deciphering the "right" way to climb this thing is pretty hard. I think 10d is more reasonable onsight rating. The bolts are well-placed and protect the crux of the climb adequately. I found 3 blue Metolius or green Alien placements. A couple of small nuts are also nice to have. The top section probably goes at hard 8, and there will be groundfall/ledgefall potential at the chains if you do not supplement the bolts.